You might notice a new blue and gold addition to your wallet in the next few weeks as the Reserve Bank of Australia releases the new A$10 note into circulation. The new series of Australian banknotes are not a designer’s dream but they are the strongest yet in terms of preventing counterfeiting. The first of its kind polymer note was introduced by the Reserve Bank of Australia in July 1992. This A$5 banknote was arguably the most secure banknote in circulation anywhere in the world. But in the intervening 25 years banknote security technology, for both polymer and paper banknotes, has improved and Australia’s first polymer notes were no longer world leading. These new notes take us back to being a world leader in this technology or at least equal to the new £10 “Jane Austin” banknote released recently by the Bank of England. Read more: Our punk, jarring five dollar note: so bad it’s good or just bad? The next new banknote to be released will be the A$50, planned for 2018 and the A$20 and A$100 in later years. The new A$50 banknote will be particularly important since, in 2016, nearly 84% of our counterfeit notes are of that denomination. The rate of counterfeit notes is usually quoted as the number of counterfeits per million notes in circulation (ppm). Issuing authorities usually like the number to be under 50ppm. Canada had the highest rate of counterfeiting before adopting the polymer note, it reached a peak of 470ppm in 2004 and stayed high until the release of their polymer banknotes in 2011. Their rate is now around 10ppm. In contrast to this, the Australian rate rose to about 15ppm towards the end of the first decimal paper money series but dropped dramatically to 1 or 2ppm when the polymer notes were introduced. The rate rose to as high as 25ppm in 2015. There are a number of reasons for this. Computing and printing equipment has become more sophisticated and cheaper. Quality printing on polymer is now possible with modern printing and copying equipment. Also counterfeiters need only simulate a banknote, not reproduce it exactly, to fool us. In 2016 31,682 counterfeits were used before they were detected. However not all fakes go unnoticed. For example, the “waxy” feeling of a A$10 banknote in 1966 failed to fool a milk bar owner in Ashburton and the forgers were apprehended within a few hours. The new banknotes retain all of the security features of the first series of polymer banknotes, but with some new additions. The A$10 note is still printed on the same polymer material, has a clear window and has micro-printed verses from the poems of Banjo Paterson and Mary Gilmore. All polymer banknotes internationally have these two features as neither can be reproduced on paper copying machines. 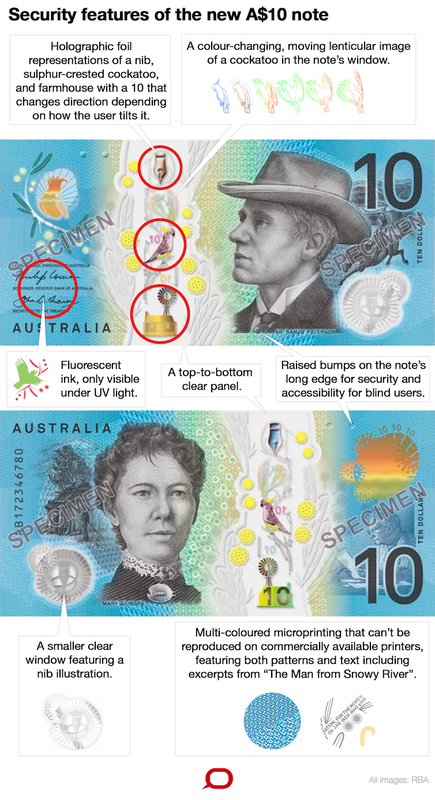 Both the new A$5 and A$10 banknotes include a top to bottom clear area with a number of devices that change colour when moved or when exposed to different light sources. These are called “optically variable devices”. These are similar to the original 1988 A$10 commemorative banknote that had a diffraction grating, fine metal lines that when exposed to the light change colour, depicting Captain Cook. The devices in the new banknotes are like this but use more robust technology. The new notes also have a tactile feature to assist vision impaired users. The A$5 note has one raised dot on the top left hand area and another on the bottom central area. The A$10 banknote has two raised dots. These first appeared on the Canadian polymer banknotes in 2011 and are also on the new Bank of England notes. Another new feature on both the A$5 and A$10 banknotes is that the serial number and the year of printing fluoresce under UV light. This is quite common technology because its used in paper notes as well. One of the reasons why the currency of other countries has become as secure as ours is the commercial and technical success of the company that produces the polymer substrate used in the notes. In the early 1990s the Belgium chemical company, Union Chimique Belge (UCB) built a plant in Craigieburn, near Melbourne, to manufacture the polymer substrate for the new Australian banknotes. This was the first plant dedicated to producing polymer banknote substrate. In 1996 the RBA and UCB established a joint venture, Securency International, to market the technology internationally. This venture was successful and the many countries in the Asia-Pacific region adopted the new technology. Some of the success of the company was marred by illegal conduct, with the director of regional sales for Africa, Peter Chapman, jailed for bribery in the UK. UCB sold its share of Securency to the UK company, Innovia Films, in 2004. In 2013, Innovia acquired the RBA’s 50% share in the business and renamed it Innovia Security. The large Canadian packaging company, CCL Industries acquired Innovia Security in February 2017. It merged with the Banknote Corporation of America to form CCL Secure. By the end of 2017 this company will have produced more than 55 billion polymer notes in 80 denominations and and in 24 countries. This latest series of Australian polymer banknotes will place us once again at the forefront of banknote security. But continuing research, development and new features will still be required to keep us there.